It’s such a treat to explore new places and new venues. I don’t live far from Perivale in West London, but somehow St. Mary’s Church has remained an enigma, until last Sunday afternoon. This fine little church, just off the A40, dates back as far as 1135. Seating just 70, it serves as the ideal backdrop for classical recitals and features an immensely popular programme of concerts and events. It provides the necessary tranquillity and serenity required for this type of concentrated music making. The Church hosts regular Sunday afternoon recitals which are followed by a spectacular array of homemade cakes and tea; surprisingly there is no entry fee, just a retiring collection if you so wish to contribute. There can’t be many places in or around London offering such a sumptuous occasion entirely free of charge. This concert featured a narrator and a pianist; words and music. What a wonderful combination, and one which will no doubt appeal to both music and literary lovers everywhere. Alicia’s Gift; the Concert of the Novel was performed by acclaimed author and music critic Jessica Duchen (who narrated) and prize-winning pianist Viv McLean. 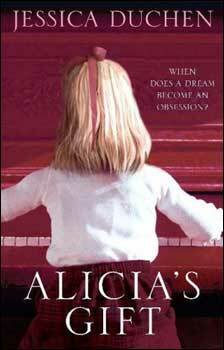 Alicia’s Gift is a novel written by Jessica, dealing succinctly with the perils of becoming a concert artist. It’s a heart rendering and extremely poignant tale of a young girl who discovers a passion for music at just three years old. Her musical journey begins with an innocent love for playing the piano and ends with bounteous soul-searching questions; some which will no doubt strike a chord with aspiring musicians all around the world. Finding the right piano teacher, tantrums, tears, family disputes, illicit love and performing at the International Leeds Piano Competition, are just a few of the events witnessed on Alicia’s crusade to becoming a concert pianist. It’s a beautifully conceived story which dramatically and persuasively highlights the plight of the child prodigy. The concert consisted of elected extracts from the novel which were powerfully delivered by Jessica and elegantly interspersed with performances of various piano works mentioned in book. Each piece had been carefully selected to coincide with Alicia’s musical journey, and they were all played with passion and conviction by Viv. The prose extracts were fairly short but just enough to keep the story alive and most importantly, the listener’s attention. Alicia’s love of Chopin was apparent from the outset, and the concert began with an arresting performance of Etude Op. 25 No. 1 in A flat major. This was followed by the polish composer’s Third Ballade Op. 47 in A flat major, which inspired the young prodigy to imagine horse riding on the moors. The Minute Waltz in D flat major Op. 64 No. 1 and Etude in C minor Op. 25 No. 12, were both expressively characterised. Each work marked a significant event in the heroine’s life; from De Falla’s raucous Ritual Fire Dance, to Debussy’s fragrant Jardins sous la pluie (from Estampes) and the utterly beautiful sound world of Messiaen’s Prelude, La colombe. Alicia’s spell in New York was punctuated with a bravura performance of Gershwin’s ever popular Rhapsody in Blue. Granados’ Quajas, o la Maja y el ruisenor from Goyescas was particularly effective; the exquisite melodic lines where effortlessly phrased and coloured against a backdrop of shimmering, cascading filigree. The concert ended with Jessica and Viv playing a duet favourite, Ravel’s Le jardin feerique from Ma mere L’oye. The novel finishes on a positive note; Alicia has finally learnt to be true to herself. This is a highly engaging presentation and marvellous concept, offering an entirely different experience to the more traditional concert format.